General Mills is voluntarily recalling two days of production of Cascadian Farm Organic Cinnamon Raisin Granola cereal because of an undeclared allergen. There have been no reports of illness. 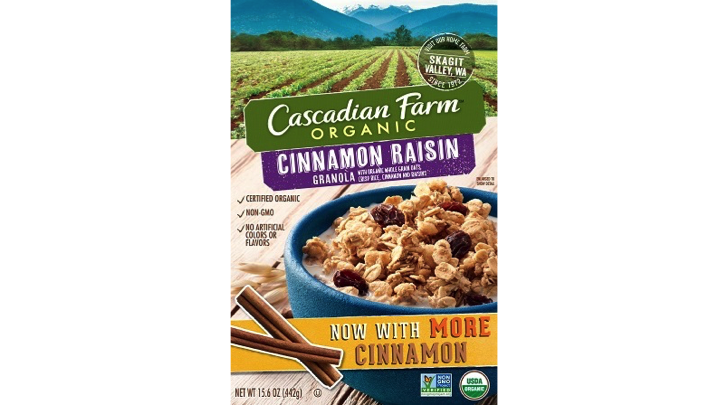 General Mills will recall affected Cascadian Farm Organic Cinnamon Raisin Granola cereal produced on those dates from customer warehouses and store shelves. Consumers with nut allergies should not consume products bearing the affected code dates and should contact General Mills for a replacement or full refund. Products containing almonds can cause illness or severe reactions for individuals with nut allergies. Consumers requesting refunds or calling with further questions should contact General Mills Consumer Services at 1-800-624-4123.